James William Lee Littrell, Jr. was born March 20, 1935 in Fort Sill Oklahoma to James W. L., Sr. and Dorothy Gilpin Littrell. He grew up in Blue Mound, Kansas where he attended grade school and graduated from High School. Immediately after graduating in 1953, Lee enlisted in the United States Army. Upon discharge, he used his G.I. Bill to attend Fort Scott Community College and Pitts State University where he earned his degree in education. On June 21, 1959 Lee was united in marriage to Sherrill Hoover. To this union four children were born. 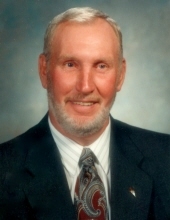 Lee began his career in education at Joint Rural High School in Stark, KS. Then in 1966 he began teaching and coaching at Louisburg High School in Louisburg, KS. Before his retirement in 1996, Lee had just about coached every sport available at the school at the time. He was well known for coaching football, basketball, track and even golf. He had a love for sports and rarely missed a game. Lee will also be remembered for his 32 year career as a Driver’s Ed teacher. Lee was a member of the Louisburg United Methodist Church and Peace Lodge #243 of Louisburg, KS. He enjoyed watching sports and working with his hands, he had a great talent for woodworking and through the years he completed many beautiful pieces. Lee was a “people” person and never met a stranger. He enjoyed talking to and meeting people. Lee also had a good sense of humor, and he could be known to pull a few pranks or fool you with his kidding. Lee was preceded in death by his parents, son Kevin Littrell, sister Nelda, brother Charlie, and brother-in-law Laine Smethers. He survived by his wife of 60 years, Sherry Littrell, daughter Lisa Spradling (Brent), daughter Karla Breuer (Brian), son Kyle Littrell, grandchildren, Blake, Jason, Cody, Clara, Jacob, and Ava. He is also survived by his great-grandchildren, Ayden, Ashlyn, Adelae, Jude, McKenna, Andrea, and Suede. To send flowers or a remembrance gift to the family of Lee Littrell, please visit our Tribute Store. "Email Address" would like to share the life celebration of Lee Littrell. Click on the "link" to go to share a favorite memory or leave a condolence message for the family.